When confronted by someone of fierce political and social commitment – particularly if their bent is way to the left – I always wonder if they’re really that dedicated to the cause or whether the cause fills some desperate void in their life. You don’t have to wonder for too long in Sally Potter’s “Ginger & Rosa,” a film about an impressionable and innocent London teen who converts her anger and anxiety over personal betrayals into a righteous anti-nuke crusade. The girls of the title are among the first of Britain’s post-war baby boomers. 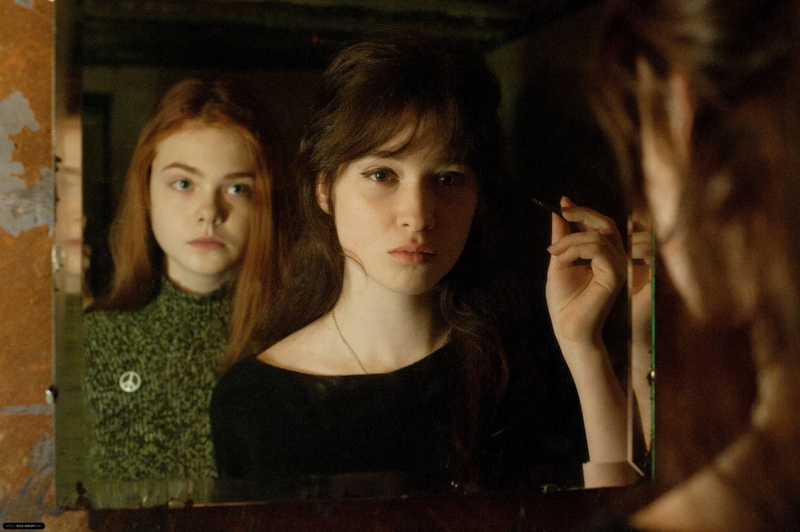 It’s 1962 and Ginger (Elle Fanning) and Rosa (Alice Englert, daughter of director Jane Campion) are coming of age beneath the threat of nuclear annihilation. On one level they’re just regular kids who listen to rock ‘n’ roll, giggle conspiratorially, dream about boys and shrink their new blue jeans by wearing them into the bathtub. On another level, though, the two young friends are nascent radical activists, terrified of dying in a radioactive mushroom cloud and determined to do something about it. It’s not hard to detect the sources of their alarmed world view. Ginger’s dad Roland (Alessandro Nivola) is a college professor and charismatic (if irritatingly smug) rebel rouser. And the girls get plenty of countercultural stiumation from a local gay couple (Timothy Spall, Oliver Platt) and an old leftie named Bella (Annette Bening). Early on it’s obvious that Ginger is the more intellectual of the two and the most vulnerable emotionally. Rosa tags along on their placard-waving adventures, but her interests are more personal and less idealistic. This becomes all too clear when she instigates a sexual relationship with the self-centered (and, for all his lofty speechifying, morally challenged) Roland. It’s a double betrayal – “My best friend and my…father?” — that drives Ginger ever deeper into Ban the Bomb activism. But the film never quite hooked me. Still, there’s no ignoring Fanning’s marvelous performance. Dakota’s little sister (she was only 14 when she played a 17-year-old in this movie) exhibits an astounding range and a deep comprehension of the characters she plays. I cannot think of another young actress capable of going so deeply into both Ginger’s inner and outer lives. Actually I AM a lefty. But I’ve known plenty of lefties whose activism seems to be triggered by inner issues. I am sure you have. But that is no reason to generalize. For every example of a lefty with “inner issues” you can cite, there probably is a candidate from the right with simialr issues. Thank you for your response. I am still someone who values your work tremendously, even when I don’t agre with some of your conclusions.